The visit to The Clothworkers’ Centre for the Study and Conservation of Textiles and Fashion saw a group of 12 members arrive at the former National Savings Bank HQ in Blythe road. 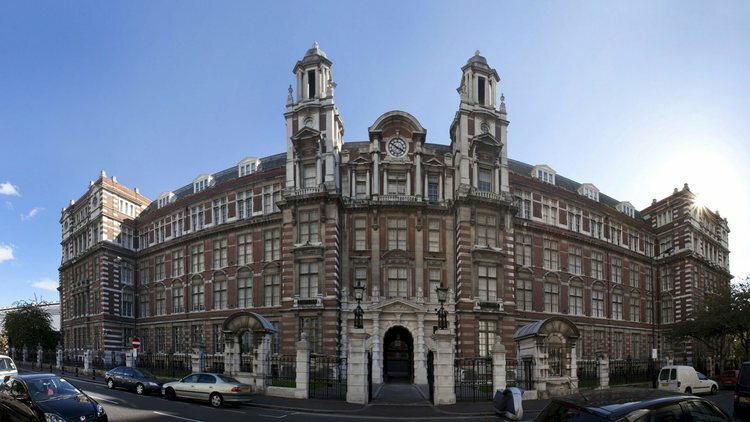 The centre under the control of the Victoria and Albert Museum is responsible for storing the nation’s costumes, dresses, hats, shoes and other fabric materials items for museums to use in fashion exhibitions. Having proved one’s identity and all handbags and cameras put in lockers we were escorted to an upper floor where we entered a controlled atmosphere designed to keep moths and other insects that can destroy fabric material at bay. 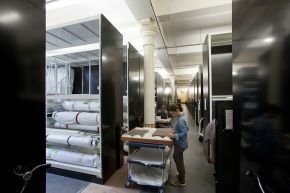 The centre is basically a very long room filled on both sides with many rolling stacks which provide hanging space for costumes and dresses (Versace, Quant etc) encased in the white material used by the police for forensic suits, and if that is not possible in special deep drawers where items can be laid flat. We were shown a pearl encrusted dress worn by Queen Elizabeth and a couple of other items but usually specific items are requested for people who come to the centre by appointment. To reflect our interest the group were shown panels by William Morris and also some panels by the Silver Studio located at Brook Green in earlier years. The curator was interested to hear facts about the former National Savings Bank as one of our members had worked there as had another’s partner and Keith was able to add further information as well. They welcome further anecdotes about the site. Check out the short video on the cloth workers website and you will also see the metal dress and the wonderful sampler that we were also shown and it will give you an idea of the layout of the department, the small library and display panels. This entry was posted on Thursday, June 4th, 2015 at 10:36 am and is filed under Buildings, Museums, Visits. You can follow any responses to this entry through the RSS 2.0 feed. You can leave a response, or trackback from your own site. Sounds great. I wish I could have made it.